The wrestling team has been hard at work this summer in preparation for the season. Immediately after school let out for the summer, 12 of the wrestling team’s finest traveled to Oak Hills High School in Hesperia for the Ken Chertow Gold Medal Training Camp, June 22-26. Chertow, a 1988 Olympian, has been running camps for 25 years, and is the best at what he does. In addition to Chertow himself being at the camp and leading sessions, 4x NCAA all-american Mike Mena from University of Iowa was there to lend his expertise as well, as well as several wrestlers from Cal. St. Bakersfield and Edinboro U. of Pensylvania. The wrestlers definitely got their money’s worth: they participated in two technique sessions per day, with a third session of hard, live wrestling and drilling in between. That’s over six hours of wrestling a day for five days. The camp pushed them hard…well: that’s kinda why we went! Every one of the participants came back a better wrestler, and with a better perspective of what it takes to be good in this sport. Capo wrestlers posing with a very sweaty Ken Chertow (blue shirt, middle) after one of the live sessions…hey, the guy works hard! The only question that remains is: will they take what they’ve learned and apply it? Time will tell. To be honest, it appears as if a select few are listening, but for most, it remains to be seen. 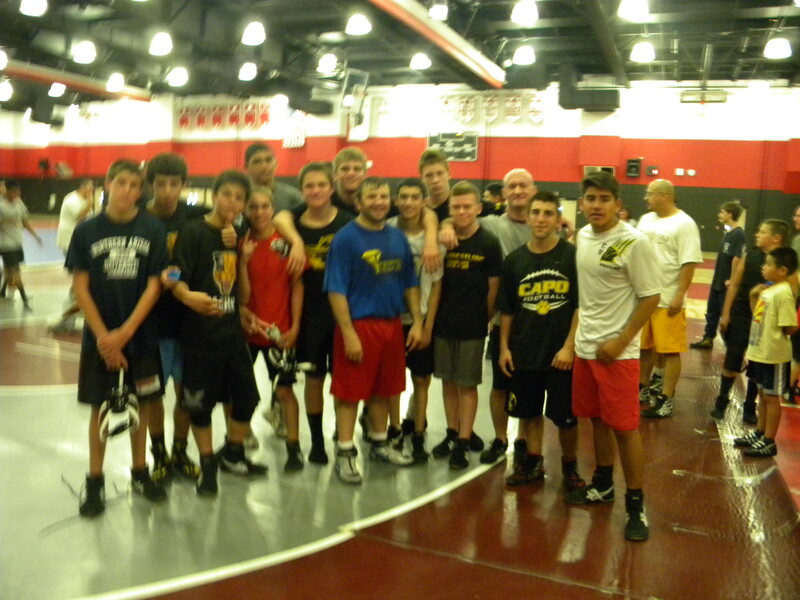 After a few days off, the team jumped right back into training in July with the Capo wrestling camp. Twice a week the wrestlers lifted, learned new technique, drilled old technique, and wrestled in the annual summer league scrimmages. The lifting they did was a continuation of a program the team started in late spring, the new technique was all over the place, and the old technique they drilled came from the Chertow camp and from Capo’s own system. This last week, guest clinicians from Cal Baptist University have stopped by to share their expertise with the guys. Summer league culminated in the summer league finals tournament at El Dorado HS. Jose Sarabia placed second in JV, while newcomer Noah Husband showed promise for the future, placing fourth at Novice. The team gets a break in August, before coming back in September to hit it hard again. If you are new to the team and want to get a jump on the season, there are a few clubs in the area that can give you quality instruction. They are at a range of pricing, but all are a worthy investment. In either case (veteran wanting summer camp info, newbie wanting club info), contact coach if you are interested. Mike Logan earned a 4.0 last semester. Wong, Knecht, Logan, and Coley earned 4.0’s, while Fitzpatrick earned a 5.0! That is astounding, gentlemen! Awesome job; you have made your team and your family very proud! In other news, Landon Hume, Ian Brault, Jonny Gutierrez, Jason Garcia, and Phillip O’shea all medaled at tournaments last week. Lets see if anyone can pick up some hardware this week. What a year it has been for CV wrestling! Both Juan Hernandez and Christian Hauser qualified for the state tournament in dramatic fashion (see highlights below), and both went 2-2 at the state tournament. This puts them in the top 20 of the whole state of California in their respective weightclasses. Russell Fitzpatrick, Kyle Coley, Ryan Tye, Mike Davis, Ryan Knecht, Wesley Wong, Shane Johnston, Mike Logan. Great job to all those named, as well as all those wrestlers who are working hard without much recognition. 6 league champions, 6 CIF medalists, 2 state qualifiers, 7th in Orange County, 3rd in South Coast League, 1st at Edison Beach Bash…the list of accomplishments goes on. This has been a one of a kind year. Lets be sure to keep the momentum going, folks. We can soar to greater heights in the coming years, so lets not be satisfied with this! This weekend five CV wrestlers wrestled with absolute heart and soul. Seniors Russell Fitzpatrick and Victor Mendoza wrestled the final matches of their careers, while Phillip O’shea, a sophomore, wrestled in his first Masters tournament. They “went to war” and left it all on the mat. Fellas, we are very proud of you. Each of you faced adversity in this tournament, and each of you faced it in a courageous way. It would be very easy to give up or let it mentally get to you, but you guys ended with a bang, not a whimper, and though you did not qualify for state, how you battled out there is what matters. Seniors Juan Hernandez and Christian Hauser likewise wrestled tough, qualifying for state. Good job fellas! The Southern Section Masters meet is a meat grinder of a competition. Every match is against a quality, tough opponent. You must be on guard and completely focused for every match. Make one mistake and you are done. Needless to say, its tough just to get there, much less to medal at the meet. The top 9 advance to the state meet. That sounds like a lot, but given the quality of wrestlers there, it is extremely difficult to place in the top 9. The medals go not necessarily to the most talented, but to the ones with the most focus. The reason why its 9 instead of, say, 3, is because of the Southern Section’s size (over 250 schools), and the quality of wrestlers. Weaker and smaller sections, like LA city or Oakland, only get 1 or 2 qualifiers, because those tournaments are much easier. The number reflects the relative toughness of each section. That the SS gets 9 should tell you something about the tournament. Throughout the whole weekend, there was drama, and stories that came out of the weekend that will serve as good examples for the younger guys. Russell battled his heart out despite an injury to his hand that greatly affected his ability to do what he does best (namely: ride on top and turn guys for pins) and his ability to take a wrestler down. Juan wrestled like a man every match. In his quarterfinal match he was wrestling a guy that was, quite frankly, muscling him around. The second period came, Juan reversed him, and within 30 seconds put him on his back and pinned him. That’s how you handle a moose. Christian had perhaps the toughest road to state that I’ve seen in a while. He had an injured ankle *and* knee and had to go through a gauntlet of tough opponents, guys that were better than him on paper. First, a highly ranked wrestler was upset in the early rounds of the tournament, and after C won his first consolation round (he was 1-1 in the tournament prior to dropping into the consolation bracket), this highly ranked wrestler from MLK matched up with Christian early in the consolation bracket. C pins him. 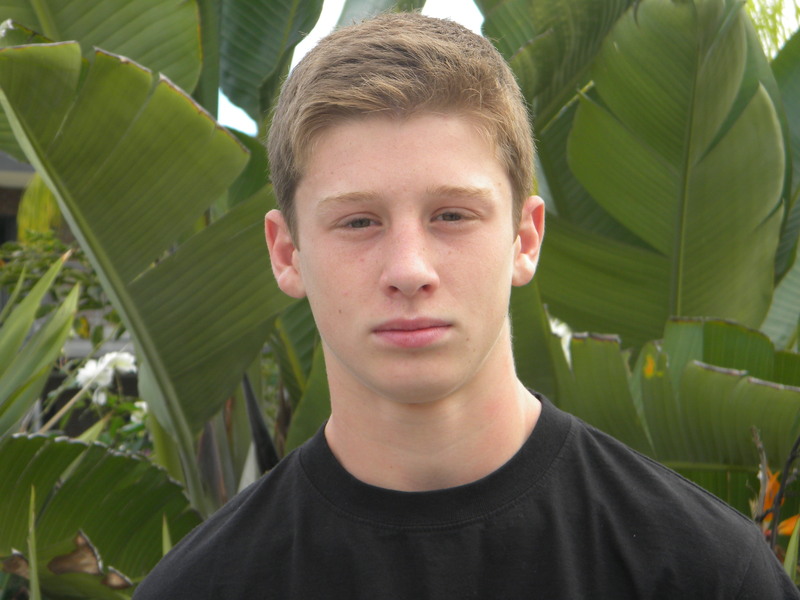 The very next round he faced Johnny Sanchez of Santa Ana, who was #1 ranked in the OC….and oh yeah, he’s beaten Hauser the last 4-5 times they’ve faced. Tough draw! Though C lost to him, he fought hard. This meant he dropped into the “crying round.” This is a four man bracket where the wrestlers fight it out for that last spot–9th place–to state. It is dubbed the “crying round” because of the heartbreak involved for those who lose–they fight so hard back from the brink of defeat only to be sent home with one more loss. In the first match of the bracket, C faced Subastian Chavez of Colony, who defeated him last week at CIF. C nails him 11-5. 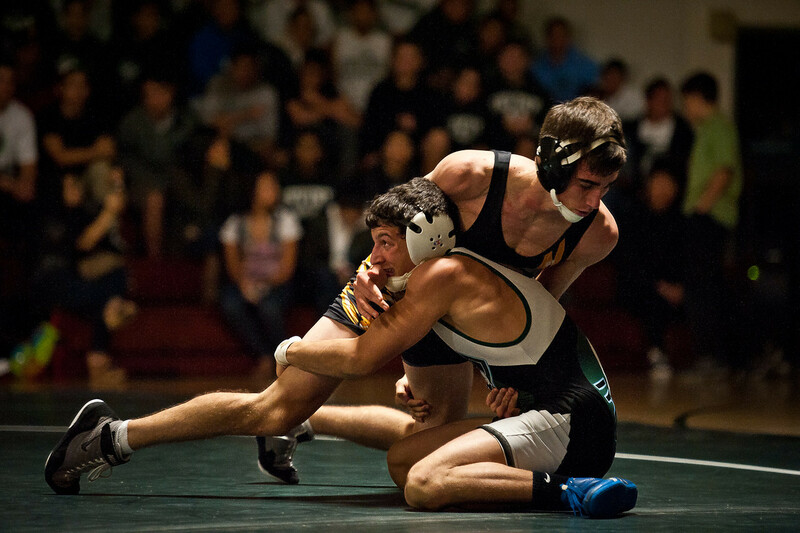 Then, in the 9th place match, he faced returning CIF champ Luis Ortiz of Magnolia. There were a few controversial referree calls that did not go his way, and largely due to those calls, C found himself behind 6-3 in the third period. At this point, he could have easily came apart or given up, but he kept his focus and kept scrappin. He pulled a 5-point move out of his bag of tricks and pinned Ortiz to go to state. I mean you shoulda seen the move…the kid was pinned in the air. Like I said, the weekend was filled with drama. ****In other news: we now have 9 wrestlers signed up for club (not counting outgoing seniors who are going to continue wrestling in their clubs in the spring). This is over two times the amount we had 2 weeks ago. Lets keep this going to see if we can get 15 or more signed up for club in the spring! This weekend at CIF, the Cougars set a school record with six CIF medalists. Kyle Coley placed sixth, Christian Hauser second, Phillip O’shea fourth, Russell Fitzpatrick fifth, Juan Hernandez second, and Victor Mendoza fifth. The latter five gentlemen qualified for the Master’s meet this weekend in Temecula. As a team, Capo finished in seventh place. The weekend was a memorable one for more reasons than one. The number of medalists is obvious, but just as astounding were the many personal stories of overcoming. Kyle Coley wrestled off his onion, scoring a few upsets off the way. 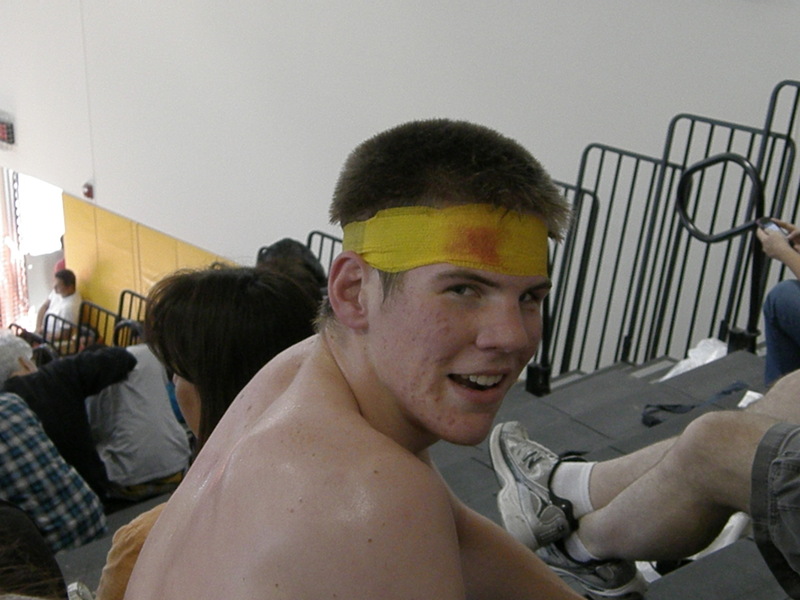 Relatively few people outside of Capo saw him as a threat, yet there he was, in the medal round, defying expectations. He really stepped it up in the post season in a big way. Mike Davis took a big jump mentally when he upset the #3 seeded wrestler from Alta Loma. That kid just wanted to win, and he was going to get it. I dont’ know how many times he fought back from a deficit to gain the lead. He just had too much fight in him to be denied in that match. Other coaches came up to us the rest of the weekend, commenting on how awesome a match that was. Mikey showed true spirit, and that made a huge impression on the whole crowd. Juan, likewise, wrestled tough. He showed true grit in a tough overtime win in the semis, and showed guts again in the finals in overtime. Though he lost, he wrestled a very tactically sound match against the Alta Loma wrestler, and came within inches of pulling it off. 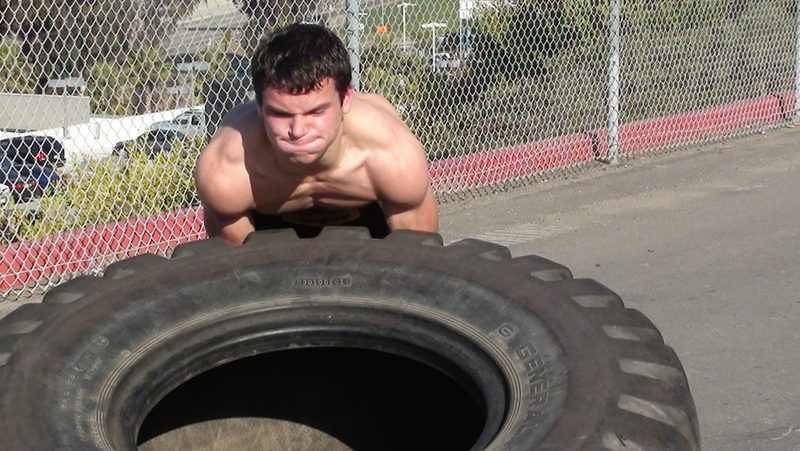 Flores (the Alta Loma wrestler) is much higher ranked than Juan, but rankings mean precisely jack squat. Though Flores pinned Juan in the first period last year, this time around Juan gave him quite a run for his money…Juan’s gonna get him next time. All CV wrestlers showed heart at CIF. Those were just some of the standout moments. I’m proud to coach you guys. Fans and supporters of CV wrestling, realize that this performance is and was a group project. As Ohio State coach Tom Ryan says often, “you win with people.” Great thing about this team is that this team is built upon multiple people, many of whom get no time in the limelight, many of whom came before. From parents, to boosters, administration, extended family, club coaches, our youth coaches Hall, Goddard and Donaldson, coach Flo and Zeller, to our current staff coaches Morgan, Igram, Cordi, and Wells, and too many more to mention…all have contributed greatly to building this program. If you are not currently on this train, jump on. We are building this program and it’s gonna get even more fun.